The 9th Congressional District includes Kew Gardens, Forrest Hills, Middle Village, and Rego Park in Queens and Sheepshead Bay, Mill Basin, Bergen Beach, Manhattan Beach, Rockaway Park, Breezy Point and Belle Harbour in Brooklyn. Each time the New York Mets take the field this summer the Grand Central Parkway, Northern Boulevard, and the Van Wyck will be clogged with cars. The 7 train will disgorge thousands of fans. And of course there are the planes. What would a day at Shea Stadium be without the roar of the Delta shuttle? But what you won't be able to do very often is take a ferry to the game. That is because the private operator that runs the serviced announced that they would only be offering the water route to the park for games played on weekends and select Fridays. The Shea ferry is not the only ferry eliminating service. The much-ballyhooed service from Long Island City has also been dry-docked, as has the weekend service to Riis Park in Rockaway. The reason these ferries fail is that they are being asked to provide a service at a reasonable fare, without any subsidy. They are being asked to provide mass transit, but without the help that our bus and train services get. During the early 20th century, New Yorkers were served by 125 different ferry routes. But with the construction of a more extensive network of bridges and tunnels, service began to dwindle, and between 1967 and 1989, waterborne passenger transportation ceased to exist in the city. A century after the peak of ferry travel, New York's transportation infrastructure has reached a critical mass. We have reached capacity on our roads and rails. The 2000 Census showed that the average New Yorker spends an hour and twenty minutes commuting back and forth to work each day. A separate study, done by the Texas Transportation Institute, found that New Yorkers waste 696 million gallons of fuel a year standing still in traffic - second only to Los Angeles. Our subways and busses are not much better off. Better service and the Metrocard have filled trains to the brink. Even the rightly maligned franchise busses are full most mornings. So why so slow to dip our toes in the waters of ferry service? Much of it has to do with start-up costs. Ferries are expensive. They start in the $3 million range and run to over $10 million. Some of it is figuring out appropriate parking and landing facilities. (Although in many waterfront communities these sites are obvious, like Sheepshead Bay, College Point and Harlem for example). But the biggest obstacle to progress is the mindset that the private sector will do this alone. They can't and they won't. 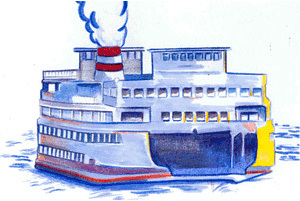 New York Waterways is the biggest of the private ferry services. They have done well with the "short haul" of the New Jersey to New York routes. Lots of runs, a fleet of busses, they have it down. Along with a few other brave start-up ferry operators - New York Water Taxi, Seastreak, and Liberty Landing Water Taxi among them - they have begun to establish a network of service. While nothing comparable to the 125 routes of a century before, the 35 to 50 routes they run seasonally represent an important start. The obstacle operators like New York Waterways find when looking to do the longer routes that will have the greatest benefit to the region's traffic and pollution problems is that the fares becomes uncompetitive with the subway, Long Island Rail Road or even the tolls on the tunnels. That is where the city's existing policy toward ferries fails to make sense. Ferries are simply floating busses, and as such, they should be subsidized like busses with wheels. As long as the city sees fit to subsidize the operating costs of those providing service on the land, municipal leaders ought to have the vision to extend the same policy to those operating on the water. The city should begin an active purchasing and land review process to make ferry service part of the integrated transportation plan of the city. Metrocard readers on deck, full transferability for passengers stepping into the subway or onto a bus. And initial forays into service should not be done on the cheap. Ferries should be run frequently enough so as to allow commuters the flexibility they need to compete with alternative modes of transportation. Just as no one would expect commuters to embrace a new Second Avenue Subway if it were only to run twice a day, no one should expect ferry service to succeed if it is inconvenient. I've started the process by purchasing three fast ferries in the new federal transportation bill. Every six years, Congress votes on the Transportation Equity Act, a bill that pays for highways, roads, bridges, tunnels and mass transit projects across the nation. The House passed a $275 billion version of the transportation act and the Senate passed a $318 billion version. Now the two sides must work out the differences in conference before it goes to the president for approval. As a member of the transportation committee and a representative of a district that includes waterfront neighborhoods like Sheepshead Bay, Mill Basin, Bergen Beach, Rockaway, Breezy Point and Belle Harbour, I have requested ferries that will launch a Rockaway commuter service. So soon, you may not be able to reach Shea by boat, but at least you'll be able to visit the beach. Anthony Weiner, a Democrat, represents congressional district 9 in Queens and Brooklyn. He serves on transportation and infrastructure committee.